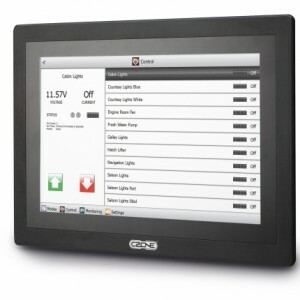 It is essential to have a switchboard to manage and control the distribution of energy around your vessel or motorhome. This can achieved with a conventional switchboard encompassing circuit breakers mounted in a panel, or with digital switching where loads are controlled via screen or mobile device and actual circuit protection is mounted closer to the loads they control. 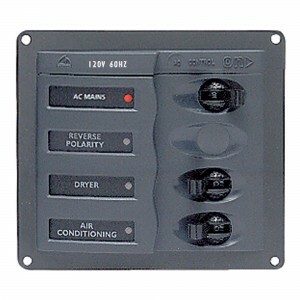 The Marinco switchboard range comprises model with and without battery monitoring and has board for both DC and AC application. 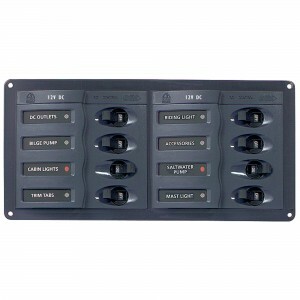 Boards are manufactures for marine grade powered coated aluminium and fitted with Airpax circuit breakers. Boards have green LED label backlighting for night reading and red LED on indication to show when circuits are active. Please see a selection of panels below. Please feel free to contact us to see the complete range.